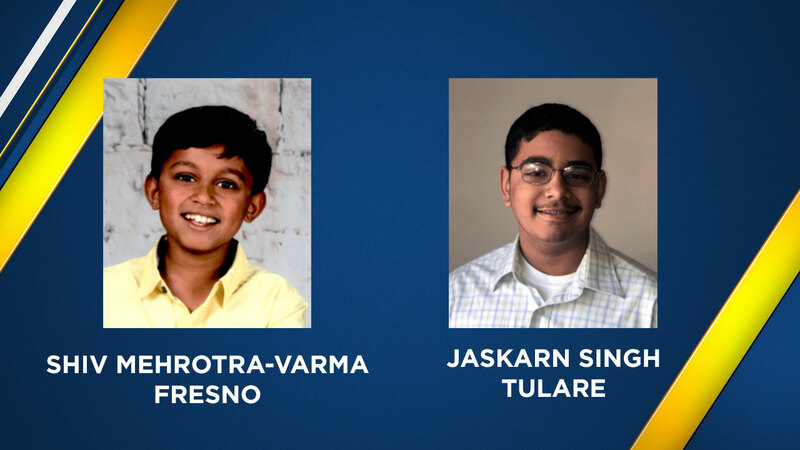 Shiv Mehrotra-Varma, 11, from Fresno and Jaskarn Singh, 13, from Tulare will be competing at the 2018 Scripps National Spelling Bee. FRESNO, Calif. (KFSN) -- The Scripps National Spelling Bee starts Tuesday, and two boys are hoping to keep the trophy here in the Central Valley. Shiv Mehrotra-Varma is 11-years-old and is from Fresno. He attends James S. Fugman Elementary School, and he says his favorite book is "The Hobbit" by J.R.R. Tolkien, his favorite sports player is Kawhi Leonard of the San Antonio Spurs, and his favorite historical figure is Benjamin Franklin. When he takes to the stage, he will be wearing number 40. Jaskarn Singh is 13-years-old and is from Tulare. He attends Alpine Vista School, and he says his favorite author is J.K. Rowling, his favorite food is pizza and "anything spicy," and his favorite subject is science. When he takes to the stage, he will be wearing number 62. Last year Ananya Vinay from Fresno, now 13-years-old, was the best speller in America and took home the trophy from the Scripps National Spelling Bee. Vinay will be attending this year's spelling bee, not to compete, but to watch the competition as a special guest. Vinay attends James S. Fugman Elementary School, which is coincidently the same school attended by Shiv Mehrotra-Varma, one of this year's competitors. 13-year-old Ananya Vinay took home the title last year and will be returning this year as an honorary guest.